Earlier this year, Coca-Cola rolled out its first TV spot made completely with user-generated content. 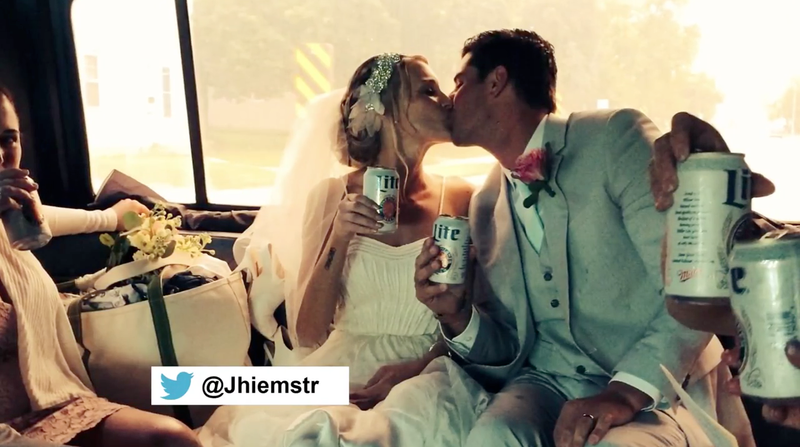 Now, it's Miller Lite's turn to shine the spotlight on its fans. In May, the beer brand launched an #ItsMillerTime campaign, in which it used packaging, promoted tweets and its social channels to ask people for their best summer photos—with cameos by the retro-cool Miller Lite cans, of course. The brand says nearly 180,000 photos were submitted. (It further claims that #ItsMillerTime has been the No. 2 branded hashtag on Twitter since May 7, trailing only Adidas's #allin). They're all fun snapshots—not particularly compelling, but "relatable," as they say. And as for the wedding couple—more power to you.